This lesson discusses how to properly mark up text. 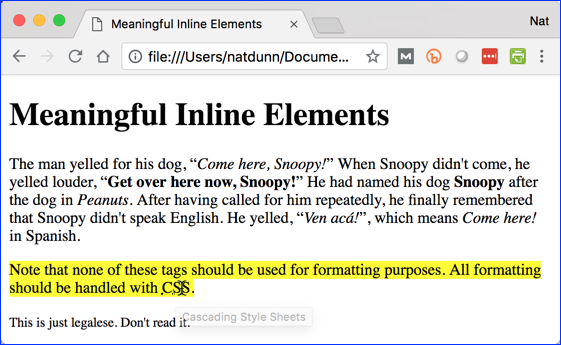 With just a few exceptions, it does not discuss how to change the formatting or display of these elements. This is a task for CSS, which is not covered in this lesson. Learn to add paragraphs to the page. 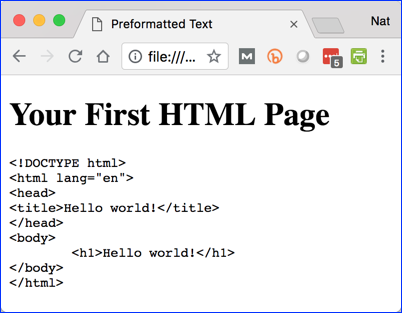 Learn to use HTML headings. Learn to separate sections with breaks and horizontal rules. Learn to create quoted text. Learn to create preformatted text. Learn to use phrase elements. If you would like to read more, the whole story of "Pooh Goes Visiting" is available at http://www.just-pooh.com/stories.html. It was originally published in Winnie the Pooh on October 14, 1926 by Methuen & Company. HTML supports six levels of heading. The tags are <h1>, <h2>, <h3>, <h4>, <h5>, and <h6>, descending in importance from <h1> to <h6>. Headings are block elements. Create a new page and save it as index.html in the Text/Exercises directory. Write code to make the page look like the one in the screenshot above. 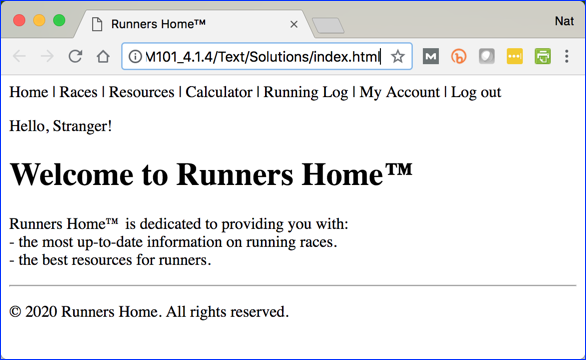 - the best resources for runners. &#8226; the best resources for runners. Modern browsers don't do anything visual with the cite attribute. Blockquotes should not be used simply to indent text from both sides. CSS can be used for that purpose. Blockquotes cannot be contained within paragraphs. Blockquotes cannot have text as a direct child. Usually, blockquotes contain paragraphs (<p> tags). Occasionally it is desirable to output content as it is laid out in the code, whitespace and all. The <pre> tag is used for this purpose. 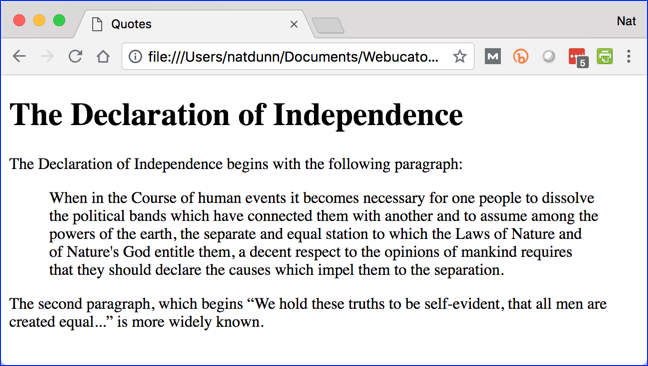 It is often used in online coding tutorials so that the whitespace shown in the tutorial reflects how it would appear in the document it represents. The code below shows how <pre> is used. <abbr> Used for abbreviations. Use the title attribute for the unabbreviated version (source) No special formatting. The example below shows how these inline tags are used. he finally remembered that Snoopy didn't speak English. All of these effects can be created with CSS, so if you just want to change the formatting without implying any specific meaning, you should use CSS instead.